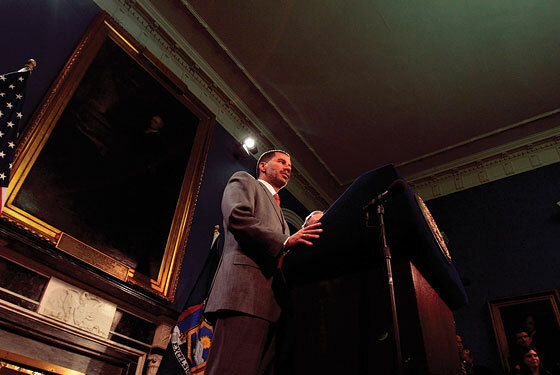 Governor Paterson’s reelection campaign has received a surprising $3.2 million in donations—almost all from entities with clear interests in Albany legislation, including many, many developers—since April 14, shortly after he assumed office. Here, a selection of donors who gave $10,000 or more, with individuals’ backgrounds in footnotes beneath. 1 Founder of Renaissance Technologies hedge fund. Worth $5.5 billion. 2 Developer. Named a Virginia apartment complex after his daughter Noelle. 3 Founder of Barnes & Noble. 4 Married to founder of Barnes & Noble. 5 Satellite-communications mogul. “Bernard Schwartz” is also the birth name of actor Tony Curtis. 6 Major contributor to Club for Growth 501(c), which, like Paterson, supports expansion of the state’s charter-school program. 7 Major contributor to Club for Growth. 9 Founder of Club for Growth. 10 Runs state-government health-care company AmeriChoice. 11 Developer. Raised over $500,000 to defeat U.S. Representative Sue Kelly (R-NY) in 2006 after she voted for a ban on gay marriage. 12 Developer. Involved in management of two upstate racetracks. 15 Democratic donor from North Carolina; TV producer and daughter of H.A. “Humpy” Wheeler, the NASCAR king of Charlotte. 16 Founder of the YES Network; media mogul. Major Democratic donor. 18 Chairman and CEO, Loews Hotels. Brother produced Kevin Costner movie The Postman. 21 Metals trader and member of British Virgin Islands Botanic Society. 24 Real-estate heir; caught in 2000 bribing homeless men in Milwaukee with cigarettes to vote for Al Gore. 25 Corporate lawyer (son of famous litigator David); made his entire $25,000 donation via credit card. 26 Member of the New York City Housing Development Corporation’s Board of Directors. 28 Former Texas lieutenant governor; told Dan Rather he pulled strings to help George W. Bush get into Air National Guard. 30 Investment banker; socialite. Wife’s name is Celerie (pronounced “celery”). 32 Founder, National Heritage Academies (charter-school group). 33 Developer and gay-marriage advocate. 34 Developer and former resident of a 256-acre llama farm. 35 Milwaukee-area restaurant owner and frequent Democratic donor. 36 Albany attorney. Worked for Mario Cuomo. 37 Real-estate finance exec; son of former governor Hugh. 38 Widow of Wal-Mart heir John T. Walton. 42 Heir to the Master Lock fortune; gay activist. 43 Publisher of Zagat guides.